Khat (Catha edulis) is a flowering shrub native to northeast Africa and the Arabian Peninsula. 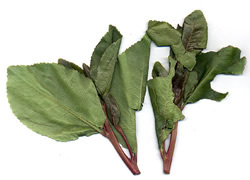 Individuals chew khat leaves because of the stimulant effects, which are similar to but less intense than those caused by using cocaine or methamphetamine. Other names by which Khat is known include: Qat, Kat, Chat, Kus-es-Salahin, Mirra, Tohai, Tschat, Catha, Quat, Abyssinian Tea, African Tea, and African Salad. What are the active components in Khat? Khat leaves contain psychoactive ingredients known as cathinone, which is structurally and chemically similar to d-amphetamine, and cathine, a milder form of cathinone. Fresh leaves contain both ingredients. A lot of experimental evidence indicates that cathinone is the main psychoactive constituent of the khat leaf and that, in fact, this alkaloid is a natural amphetamine. Those left unrefrigerated for more than 48 hours would contain only cathine, which explains users' preference for fresh leaves. Khat is a stimulant, the effects are rather like ephedra or amphetamine and include euphoria, increased alertness and excitement, ability to concentrate, confidence, friendliness, contentment and flow of ideas. Users feel alert, relaxed and more talkative. It also reduces appetite. Effects vary with the freshness of the khat. The effects of the herb generally begin to subside between 90 minutes and 3 hours after ingestion; however, they can last up to 24 hours. Dried khat can be drunk as tea. Khat tea is also known as 'bushman tea'. The only dose we know of concerns fresh leaves. People used to take a mouthful and chewed the leaves until the effects started.